MOSCOW BALLET (IRE) (Bay 2001-Stud 2006). 2 wins-1 at 2-at 7½f, 1¼m, Royal Ascot Hampton Court S., L. Sire of 69 rnrs, 26 wnrs, inc. SP Pure Blue and of Jimivag, Star of Gallese, Heliaster Re, Libero di Sperare, Osypenko, Dusha Zachistki, Smarty Pants, Special Ballet, Running Broke, Lostasock, Painted Warrior, Bolshoi Bandit, Bolshoi Belle, Miss Carobose, Siberian Rose, Bellena, Camaric, Marimba, Be Nice, Salander, Donavia, Pink Moscato, etc. Blue Bear (g. by Moscow Ballet). See below. Fraar Mandy. 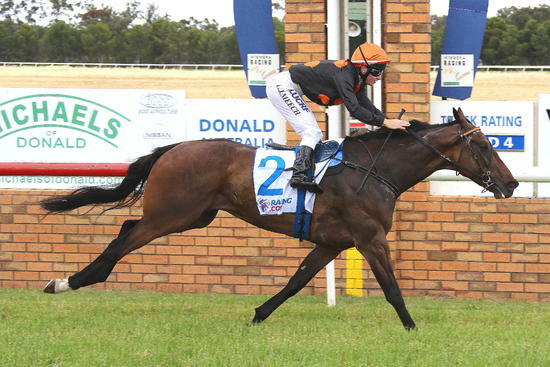 4 wins at 1400m, 1550m in Aust. Bold Senator. 6 wins to 1100m, A$100,140, SAJC Farmers Union Iced Coffee H., 2d SAJC Adelaide Cup Raceday H.
Bold Zac. Winner at 1400m, 2d SAJC MAC Stop Drug Driving H., 3d SAJC Mittys P.
Aspen Breeze (Grand Lodge). 3 wins-1 at 2-at 1000m, 1200m, R209,400, 2d Turffontein Ruffian S., L, 3d Turffontein South African Fillies Nursery, Gr.2, Clairwood Debutante S., Gr.3, Turffontein Pretty Polly S., Gr.3. ECHO MAID (Made of Gold). Winner at 2, Whangarei RC Northland Breeders' S., L, 2d Wanganui JC Waikato Stud S., L, ARC Starjam 3YO H., Go Xcellent H., 3d ARC Soliloquy S., L.
I Robot (Ishiguru). 4 wins-2 at 2-at 1100m, 1400m, NZ$115,725, A$11,650, ARC Legends Fellowship 2YO H., Manawatu RC New Zealand Bloodstock 2YO H., Marton JC Rural Bulk Spreading H., Taranaki RC Sandfords Rural Carriers H., 2d Taranaki 2YO Classic, Gr.3, Foxton RC Castletown S., L, BOP RC Ship With Seatrade H., Marton JC Richardson Drilling H., 3d ARC Lindauer Brut Cuvee H., Hawkes Bay Bedpost Hastings Get-Out H., 4th ARC Championship S., Gr.2, Wellington S., Gr.3, Waikato Guineas, Gr.3, QTC Brisbane P., L.
JACQUINOT BAY (Galileo). 13 wins from 1000m to 2000m, A$1,007,835, Canberra Cup, L, MRC Lord S., L, Master Yearlings Summer Championship Final H., VRC Rod Johnson H., Brian Beattie H., Comedy King H., ATC Cellarbrations H., Percy Sykes Tribute H., Canley Heights Hotel H., 2d MRC PB Lawrence S., Gr.2, TS Carlyon Cup, Gr.3, Bendigo JC Golden Mile H., L, ATC Might & Power H., MRC Hockingstuart H., Cup Club H., Booralite Park H., VRC Sofitel Girls' Day Out H., NSW Tatt's RC Paul Noble Mile H., 3d Albury Gold Cup, L, ATC Heritage Volunteers H., Schweppes H., 4th MRC Underwood S., Gr.1, VRC Makybe Diva S., Gr.1, MVRC Dato' Tan Chin Nam S., Gr.2, MRC Eclipse S., Gr.3, ATC Parramatta Cup, L, VRC James Boag's Symphony S., L.
Bonza Crop (High Yield). 2 wins at 2, A$137,300, BTC Alf Said The Good Guys 2YO H., Toowoomba TC City Pacific Finance Magic Millions 2YO Trophy P., 2d BTC Royal Children's Hospital Foundation 2YO H., Toowoomba TC Fitton Insurance Hopeful 2YO P., 3d BTC Doomben Slipper S., L, QTC Winter Carnival June 2YO H.
Race Record: 4 Starts 0-1-0 A$5,985.